EMO is the main reference event for DMG MORI and within every edition the company sets up a huge display of its capabilities. 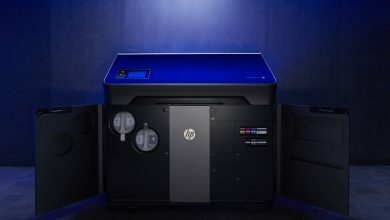 This year more than ever before, AM will play a key role, with the LASERTEC 65 DED (powder-fed) system and the new LASERTEC SLM (powder-bed) system. In total over 8 new system launches will provide insights on the company’s Digital Factory strategy. DMG Mori will present itself as the leading competence partner for metal cutting production and digitisation on around 10,000 m² in Hall 2 at the EMO 2017 in Hannover (this is larger than many entire AM-centric shows). Taking the “Path of Digitization” as its guiding principal, the company points the way to the future of the “Digital Factory” with numerous software and data-based products and services. Continued priority is also given to the automation of the machine tools and turn-key solutions. The same applies to additive manufacturing, where DMG MORI offers continuous process chains with powder nozzle and powder bed technology. In its dedicated DMG MORI Technology Excellence Centers DMG MORI demonstrates its EMO branch solutions. By integrating customers in the joint process development at a very early stage DMG MORI offers customised complete technical solutions in the aerospace, automotive, die & mold and medical sectors. DMG MORI is successful on the market in ADDITIVE MANUFACTURING with laser deposition welding using a powder nozzle. 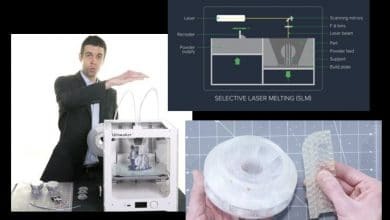 Selective laser melting in a powder bed now expands the product portfolio. In other words DMG MORI demonstrates its integral competence by bringing together the key generative manufacturing processes under one roof and ranks as a full-line provider in both the additive manufacturing of metallic components and in post processing. 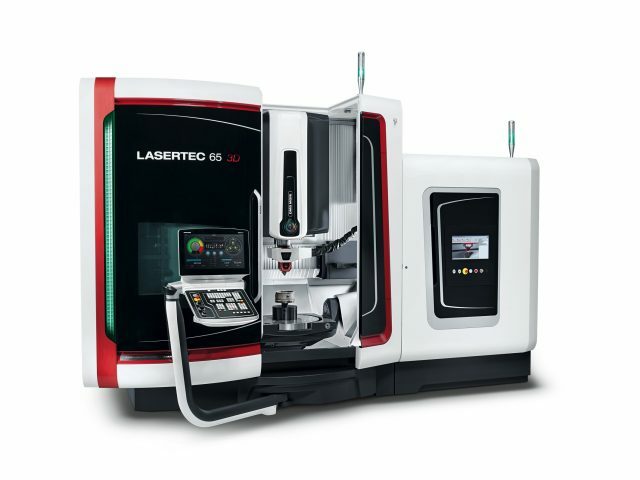 The LASERTEC 3D and LASERTEC SLM series are the cornerstones of DMG MORI’s strategic orientation in this future technology. 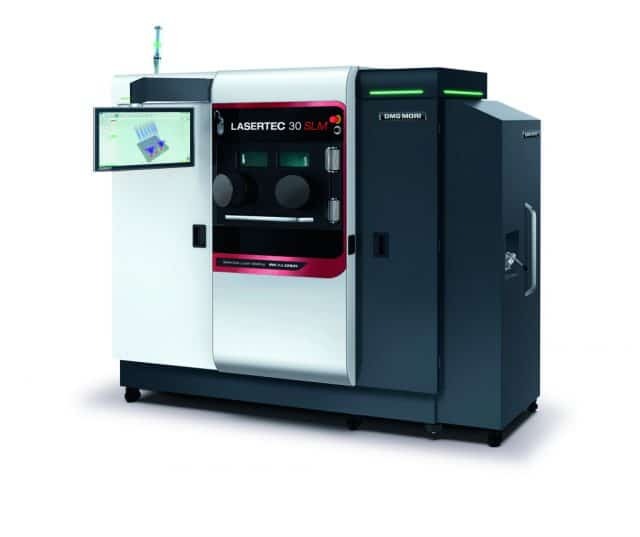 While the LASERTEC 3D hybrid successfully combines laser deposition welding by means of powder nozzle and 5-axis milling, the LASERTEC SLM series stands for selective laser melting in a powder bed. The latest innovation stages of the two processes will be presented at the EMO integrated in continuous process chains. The eight world premieres include the CTX 2500|700 as the prelude to the fifth generation of this successful series and the NTX 2500 as another new turn-mill centre. The CLX 550 expands the range of European universal turning centres. The third generation CTV 250 rounds off the program in vertical turning, while a new concept for the multi-spindle automatic turning centre is presented with the MULTISPRINT 25 and the MULTISPRINT 36. Where milling is concerned DMG MORI has expanded its portfolio with the two large machines DMU 200 Gantry and DMU 340 Gantry and the second generation of the NHX 6300 horizontal machining centre. 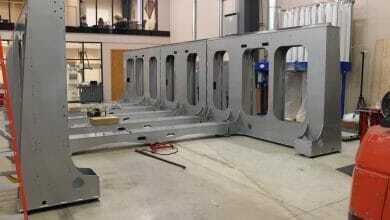 The digital change is also taking place in machine tool construction with increasing momentum. 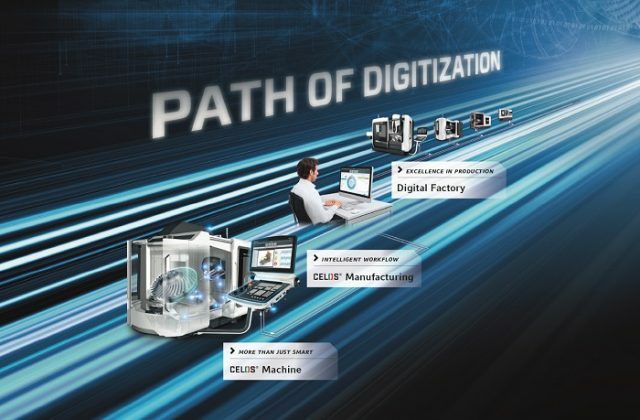 With CELOS and the “Path of Digitization” DMG MORI pursues a consistent strategy – starting with the CELOS Machine and on to CELOS manufacturing right through to the digital factory. The new CELOS versions and products allow targeted realisation of the continuity required in production. With the latest version of CELOS the new APPs, such as “CELOS CONDITION ANALYZER” or “CELOS PERFORMANCE MONITOR” have laid the foundation for the optimisation of workflows and processes directly in the machine environment. A greater focus will be given to solutions for digital workflows on a shopfloor level at the EMO. Dr. Holger Rudzio, Managing Director of DMG MORI Software Solutions, promises. Another focus of the development work is automation. It is the aim of DMG MORI that every machine in the wide and varied portfolio can be equipped with an automation option in future. Intelligent linking of the machine tool and automation is a key focus at the production locations in order to ensure customers can receive their automation solution from a single source. The offering includes the PH 150 Pallet Handling and the WH 3 Workpiece Handling systems – both of which will be presented in the new VERTICO-design. In addition Robo2Go extends the portfolio as a flexible robotic automation for a large number of turning machines. DMG MORI will be presenting integral data-based production workflows for the first time at the EMO. An adaptive CELOS planning tool for decentralised production control will be presented in Hannover for the first time. An integral workflow for tool management from the cloud to CAM and simulation and on through to CNC control will be presented by the DMG MORI with CELOS Digital Tooling. A new mobile user interface will be presented in the form of the new CELOS proTAB, which opens up the CELOS world for the first time for both competitor products and machines from other fields of technology as well as for manual workplaces within the process chain. The new CELOS netBOX opens up the seamless integration of the machines in the higher-level network structures – through to secure data interaction via cloud platforms and the Internet of Things. In other words CELOS is developing from the APP-based control and operation interface to become a data-based, high-performance planning and control platform for the digital production of the future. In combination with digital software and service solutions it is gradually being configured to become a comprehensive ecosystem, with which customers can shape their futures both individually and holistically. Despite the fascinating possibilities of digitisation, engineering and manufacturing competence remains the core business of DMG MORI. That it is why it is important to strengthen both the new and the proven. Digitisation, automation, additive manufacturing and technology excellence as well as “traditional” high-tech machines are therefore equally the focus of the innovation offensive. 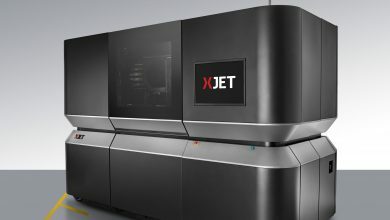 DMG MORI positions itself as a full-line provider in the additive manufacturing of metallic components in addition to machining with the LASERTEC 3D and LASERTEC SLM series. Low unit costs, automated processes and a high degree of flexibility are the key factors in an efficient production. As a leader of technology in the metal cutting sector DMG MORI is called upon to create ever more economical CNC solutions that will ensure its customers a competitive edge. To achieve this the machine tool manufacturer develops and realises holistic, application-specific turnkey solutions for the aerospace, automotive, die & mold and medical sectors in its DMG MORI Technology Centers. Experts from DMG MORI are involved in the development of customer projects at a very early stage. Together with its customers DMG MORI gains important experience and extensive knowledge. Both are used equally in the development of new machines and components right through to turnkey production solutions. “Especially where the multitude of components and materials is concerned our customers benefit from the wide range of our machines and technologies. During the EMO in Hannover we will be showcasing highly dynamic horizontal centres for aluminium and CRP components, duoBLOCK machines for the high-speed milling of aluminium as well as turn-mill technology such as mill-turn centres with integrated grinding function and a unique solution for the use of angle heads with automatic changeover of front tools for reliable processes in the 5-axis complete machining of rotationally symmetrical workpieces. 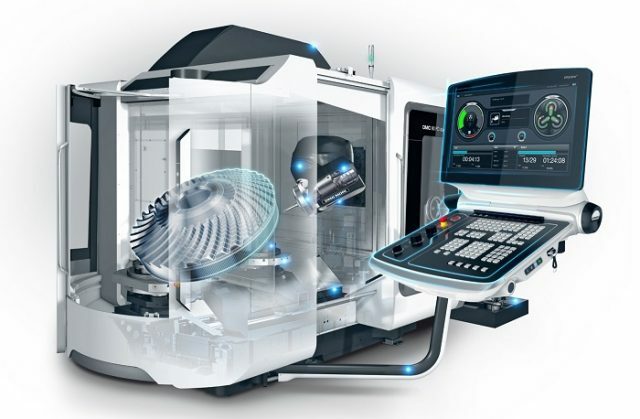 There is virtually no component for which DMG MORI cannot offer a production solution.” explains Michael Kirbach, Head of the DMG MORI Aerospace Excellence Center in Pfronten. “Under the motto ‘A full Automotive Technology Integration’ we will be presenting complete solutions or rather an integral modular system consisting of high-performance machine tools, integral technologies, automation solutions and intelligent software. This guarantees our customers maximum availability and process reliability in the automotive industry”, says Markus Piber, Managing Director of DECKEL MAHO Pfronten GmbH, about the range of services for automotive customers. 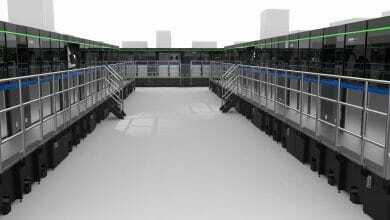 “Die and mold construction are among our core competences. Great importance has been placed on die & mold applications at DMG MORI for decades, which on the one hand has resulted in our enormous experience in this field and on the other has given and continues to give rise to path-breaking technologies. The demands on precision, long-term accuracy and surface qualities are met with high-precision and dynamic machining centres.”, says Markus Rehm, Managing Director of DECKEL MAHO Seebach GmbH. “Medical technology in particular faces special challenges such as the use of materials that are difficult to machine – magnesium and CrCo, that require individual machine solutions. Whereby the technological possibilities are not in fact the limiting factor here, instead it is the high demands on the certification requirements and standardization that determine the process in medical technology. The necessary expertise with regard to technology and efficient machining strategies are brought together in standardized, integral manufacturing solutions at the Medical Excellence Center Seebach. The resulting customer benefit lies in considerably simplified certification of machine solutions that fulfill worldwide standards.” Marcus Krüger, Head of the Medical Excellence Center in Seebach.